100% original Louis Vuitton bag. Made from paper :) But even though, it's nice. And big. Bigger than other Louis Vuitton's bags. 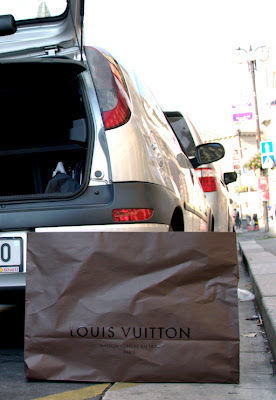 Louis Vuitton has its shop in Parizska street - the highly expensive highly known fashion stores' street. And the picture is from Na Prikopech street - maybe the second most expensive street in Prague.